#Diversiverse weekend has arrived! We had more than 50 people sign up to participate, which is a very exciting number. I'm so thrilled to read everyone's posts and so looking forward to adding lots of new books to my wish list and TBR pile. Once your posts are live, please link them through the Mr. Linky below. Please use the following format and please link directly to the blog post (not to your blog main page). 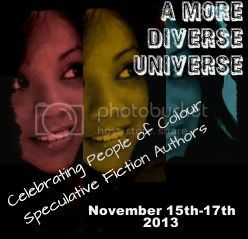 And please use the button above to bring attention to the A More Diverse Universe blog tour. Happy reading! And remember, we must create the bookshelves we want to browse, so if you want to browse a diverse shelf, read diversely! Yay! My post is already scheduled. Can't wait to dive in! Not a problem at all! In fact, that post sounds like a wonderful resource for people looking to diversify their reading. Great idea! So glad you're hosting again! I've been out of the blogosphere but totally had to write a post today. Can't wait to see all the books being talked about (coincidentally, I posed about Half World earlier this week). I'll go read your review of that tonight! This is always such a revelation to me (since I live in a fog). It makes me pay attention to things that I otherwise wouldn't notice. Thanks for organizing! YAY! So glad you were able to find a book (two of them!) to read for the event. Thanks very much for all your support of the event, Mihir! I really appreciate it. So excited for this again! I, erm, have to finish reading my book tonight, so my review won't go up until tomorrow or Sunday. Look at the participation! Thanks again for hosting, Aarti. I've been busy writing and not doing much posting. Will have to get on it. Gah, I had every intention of participating, and just totally missed that it was this weekend. Boo. Well, I guess my post will just be late - better late than never, right?? Mine's up; WordPress ate the first version, alas. Just added my link, now I'm looking forward to reading all of the other reviews and probably adding quite a few books to my wishlist/library reserve list! I've added my link and am looking forward to reading all the reviews. It's good to see that lots of people have posted already! I've just posted my review of Kindred by Octavia Butler. Thanks for finally getting me to read this. I loved it! I'm not feeling too well, so I hope it's coherent. Tomorrow I plan on spending time reading through everyone else's posts. I just posted my review of the best diversity fantasy I have read this year, The Ghost Bride. Sorry not to reviewing something new, but I kept running into problems. I read a book that I intended to review in October, but didn't like it enough to recommend it. Then over two weeks ago I ordered another. They said it had been mailed but it never arrived. It is an African fantasy called Zarha the Windseeker. I had heard good things about it and will review when and if it arrives. Thanks for having this event again this year. Posted: A Stranger in Olondria by Sofia Samatar! Enjoying reading everyone's reviews and adding to my list of TBRs. Thanks everyone. Erg, so sorry I made a mess of the Mr. Linky thing :( Numbers 25 and 26 are the same, just realized I wrote my name instead of the book's and then couldn't go back to clear the previous entry. Sigh. Thanks so much for hosting, Aarti! I can't wait to work my way through the posts. I just received my copy of Zahrah the Windseeker late. Here is my review. I will have a review of Nalo Hopkinson's The Salt Road. I think it is her best. Sorry to be slow. I had this review of Salt Roads all written when we had a big snow storm. I have been without electricity for four days.